In the last newsletter, I showed you how you can play a I – IV – V song in five different keys. Today I’d like to introduce you to the four other members of a chord family. At the end of this lesson, you should be ready to transpose a simple song into a different key. whose chorus used three bright and cheerful chords. they saw some Grammy awards. the song was better, not worse. By an overpaid producer named Henri. And it doomed the ditty to obscurity. Your life will be easier if you take a moment to memorize this pattern. I often think of music in terms of colors, so try this: The I, IV, and V chords are major. They’re the blond girls in the chord family—like Marcia, Jan, and Cindy in the Brady Bunch. The other chords are minor, represented by the dark-haired boys. I know, I know, hair color has no bearing on personality. Sheesh, I’m just trying to teach a little music theory here…. This leaves the vii° chord, the oddball of the family. Remember Cousin Oliver, the little kid who came in for the last season of The Brady Bunch to boost ratings? He was cute but didn’t quite fit. Likewise, the diminished chord, with its dissonant, jazzy sound, doesn’t fit in most straightforward rock and folk songs (not to diminish diminished chords—they’re common in blues and jazz, and many songwriters use them beautifully). C, Dm, Em, F, G, Am, Bdim. Now let’s try the key of G. This is little tricky, because once you deviate from the key of C, you need to know what “sharps” or “flats” are in your scale. For instance, in the key of G, you have an F#, not an F. Knowing this, can you figure out the chord family for the key of G? G, Am, Bm, C, D, Em, F#dim. There’s a trick to memorizing the sharps and flats in all keys, and also an amazing little diagram called the Circle of Fifths that does it for you, but both of these are beyond the scope of this newsletter, so here’s a chart of the major scales in all keys (as a .pdf if you want to print, and here if you don’t). Read left to right. Ready to try a practice activity? Print out one of the following songs from my website. They’re all in the key of G. Next to each chord, write the roman numeral identifying the role that chord plays in the chord family. For example, you’re going to write “IV” next to all the C chords. Then choose a new key from the five most common guitar keys (C,A,G,E, or D), and transpose the song (change its key). 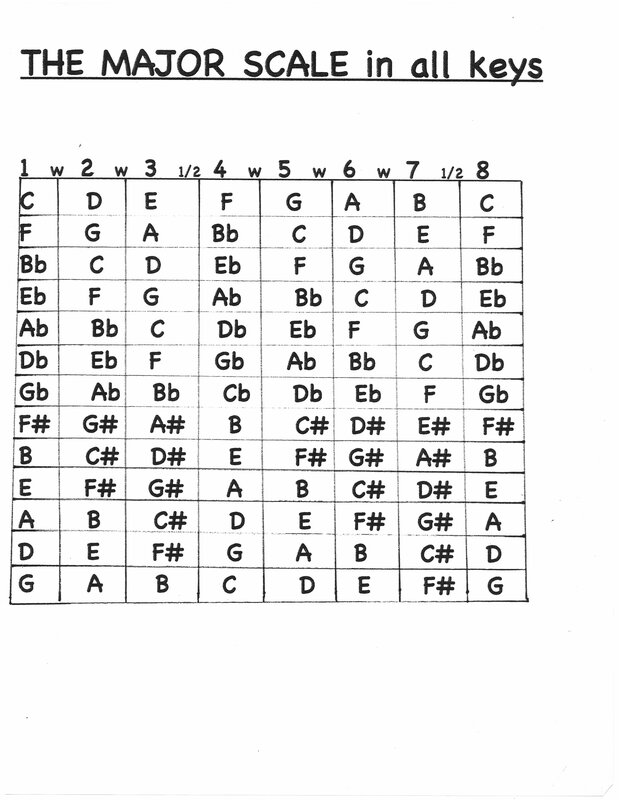 Use that major scale chart to help you. For instance, if you wanted to change to the key of A, you’d write “D” next to all C chords, because D is the IV chord in the key of A. Now play the song in its new key to confirm you did it right. Hungry for more? Try writing a song by picking a key (C and G are easiest) and using chords in that key’s family. It often sounds good to use primarily I, IV, and V chords, with an occasional minor chord thrown in to balance out the sweetness. There are no hard rules in songwriting of course—if you feel so compelled, start your masterpiece with a diminished chord. I’m sure Henri will be very impressed. First of all, I am not silly. I am majestic and awe-inspiring, my hair blowing in the wind. Second of all, the Brady theme song rhyming scheme only requires that the second and fourth lines of each verse rhyme (I broke some of the lines to make it easier to sing, but you know what I mean). All other rhymes, including “chorus” and “bored us”, are extra credit. Nicely put and easy to follow…… I am clear on what your saying about the I VI V progression. How is that somethimes you here the song in the chords not sure if I am clear… Is there a melodic progression? I always use the Harmonized Chord Scale as a bit of a cheater when writing tunes. It’s exactly what you’ve written here *except* for the V is treated as a 7th. Heh, I liked this article, very informative and easy to follow. Never thought that anyone could relate chord/scale relationships to the Brady Bunch, but you proved me wrong! Hahaha. I just sent this to my friend Robbie Rist who played Cousin Oliver in the Brady Bunch! He’s a faboo guitar player, by the way.. so your comparing him to a guitar chord is quite apropos! That’s great! I want to say for the record that I loved Cousin Oliver, and only discovered that he was a failed attempt to rescue ratings when I researched this newsletter. Could you clarify your question by giving me an example? nice job, extremly clear and informative! Thanks! just a couple of question: what’s a diminished chord? can you give me some fingerings? p.s. i want to say thank you for the wonderful lesson about I-Iv-V progression: after reading it, for teh fisrt time i realized that in the five keys of A, E, g, D, C all the three chords are major ones and could be found just counting from the first one: no more extenuathing maths with sharp and flats! Any sign of a Fall or Winter Workshop Jam? I think rhyming chorus and bored us is quite inspirational! I wish I had known about this stuff when I first started playing, but being stubborn, I didn’t learn ’til about 4 years ago. After reading many guitar books i would see this sometimes but not really understand and i thought it was more advanced but you explained it so simply i was able to memorize it right away and understand how and why it works! now i can transpose a song thanks so much! so now i will ask is there a way you can tell me how to figure out the key to a song easily? basically i know to check for certain notes and chords and then you will be able to tell but is their some simple way of doing this? am i suppose to just memorize it all? i know the circle of fifths helps but i never seem to memorize it maybe you can explain it better?